Okay I admit it, I was in love, love, love with my vintage leopard coat (from the 60’s) in the eighties and nineties. That fluffy little accent piece went with me everywhere and of course it looked tre’ chic when my plane out of LaGuardia Airport reopened it’s doors at midnight to let me on after a late connection had me running through terminals like a crazed loon. I can only imagine what the other passengers were thinking when they saw me all wrapped in my bouncy coat and slim LBD. I certainly would have been rolling my eyes at me. But never the less, I felt like a million in that coat. Today I rarely wear anything with a leopard, or animal print, I suppose the inner Tarzanna I possessed has vanished. 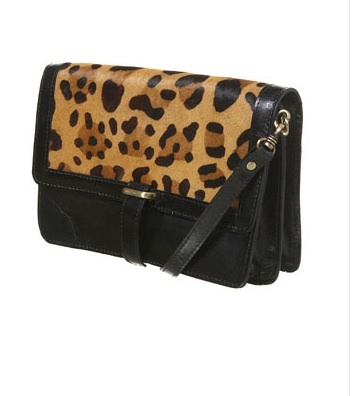 But again, rules are made to be broken or at least revived, this season I am craving a leopard bag or a leopard shoe. Maybe it’s the Mad Men influence or maybe that designers caught on for fall that just one little hint of this saucy animal print can turn a mild manner outfit into something wild. The beauty of animal print accessories is that they elevate any ensemble from a grunge combo of slouchy jeans and baggy tee to a structured dress or a pencil pant and blouse. Any pairing seems to work with this universally flattering trend. And at Dolce & Gabbana what else would you expect? These boys have been channeling Sophia Loren from the 60’s since the lines inception years ago. 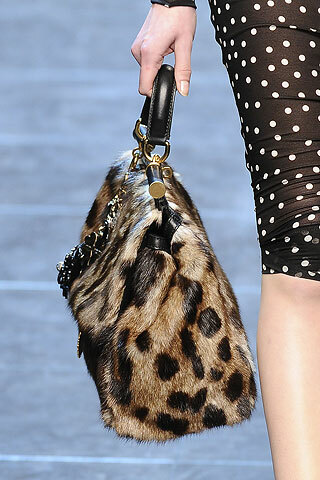 And although they included leopard everywhere from skirts, to blouses to dresses, I was crushing on the simple Miss Sicily bags in the satchel or handbag style that when paired with a black lace dress would be enough to secure a few complimentary drinks from oggling bystanders. Even hipsters like Zoe Kravitz and Alexa Chung (top photo) have been spotted for months carrying their favorite leopard pieces. One of Zoe’s favorites is the Wendy Nichols bullet bag which is a little drawstring version for those nights that you don’t want to tote around a lot. No Spend Month – Could you do it?